Barry George has lost his bid for compensation for being wrongfully convicted of the murder of television presenter Jill Dando. After the ruling, Mr George's sister Michelle Diskin said outside the Royal Courts of Justice that the Court of Appeal judge's decision was a "travesty of justice". With her brother standing by her side, she told reporters: "He lost his home, his furniture, his clothing and all of his possessions, his place within his community and his church family. "There never was any viable evidence against Barry. This whole case from April 2000 until today has been a smoke and mirrors exercise designed to placate a worried public and give the impression that justice had been done. 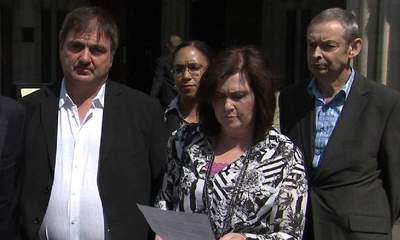 "Well neither the Dando family nor our family has seen any justice in the past 13 years." Ms Diskin added: "We are extremely disappointed with today's decision and will need to go away and regroup to decide what to do next. We cannot let this go unchallenged. "Serving eight years in prison for someone else's crime is not acceptable. Everything was taken from this man when the police started what we believe to be a malicious prosecution." The Court of Appeal decision followed the dismissal of his claim by two High Court judges in January. Mr George went to the High Court seeking a reconsideration of his case which could have opened the way for him to claim an award of up to £500,000 as a victim of a "miscarriage of justice" for lost earnings and wrongful imprisonment. It was argued on his behalf that the decision to refuse compensation was "defective and contrary to natural justice". But Lord Justice Beatson and Mr Justice Irwin ruled he had failed the legal test to receive an award. Ms Dando was shot dead outside her home in Fulham, west London, in April 1999. After his conviction in July 2001, Mr George was acquitted of killing the 37-year-old BBC presenter at a retrial in August 2008.